Vancouver, BC - Skyharbour Resources Ltd. (TSX-V: SYH) (OTC Pink: SYHBF) is pleased to announce it has now commenced its first phase of exploration on its Patterson Lake Uranium properties in Saskatchewan. An airborne geophysical survey is being flown over the next few weeks and will cover approximately 2,120 line kilometres using a VTEM system and a magnetometer survey with an additional 825 line kilometres of radiometric sensor coverage. Skyharbour has six properties consisting of approximately 388,000 acres of prospective ground strategically located near the Alpha Minerals (TSX-V: AMW) and Fission Uranium (TSX-V: FCU) Patterson Lake South (PLS) uranium discovery area making Skyharbour one of the largest land holders in the region. 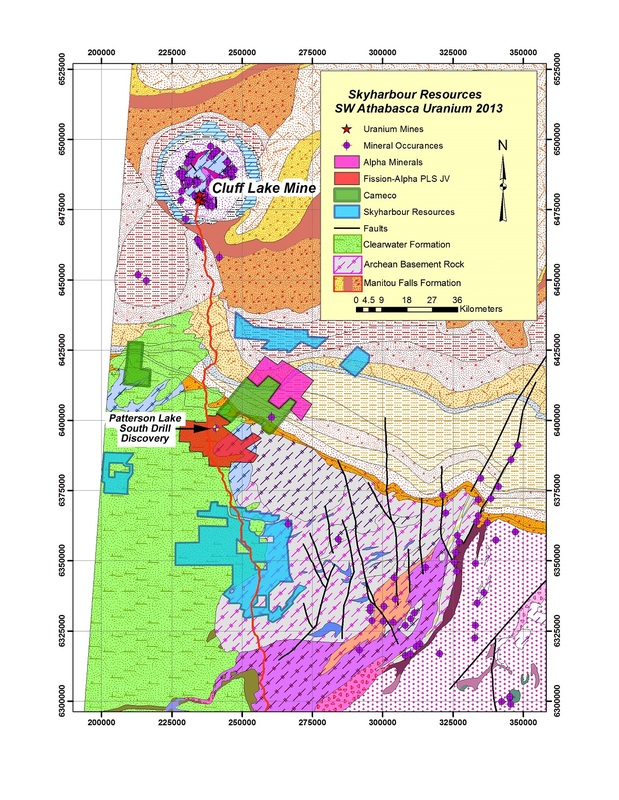 The EM and magnetometer surveys are being carried out to define basement conductors similar to the structures that host the high-grade uranium discoveries at the nearby Patterson Lake South project currently being explored by Alpha and Fission. The radiometric survey is designed to locate uranium boulder trains and in-situ uranium mineralization. The highest-priority properties being flown first include the West Patterson Property, the South Patterson Property and the Draco Property which were acquired by Skyharbour for their proximity to the PLS discovery and interpreted favourable geology for the occurrence of PLS style uranium mineralization. There was a small amount of historical diamond drilling on the Draco and South Patterson Properties which successfully confirmed the presence of graphite-bearing conductors in the region. These graphitic conductors are the primary targets at the high grade uranium PLS discovery area to the north. Skyharbour has recently signed two option agreements for its Athabasca property package wherein Lucky Strike (TSX-V: LKY) and Noka Resources (TSX-V: NX) each have options to earn a 25% interest into the seven uranium properties by making cash and stock payments up front to Skyharbour and by funding a combined $2 million in work commitments over the next two years (see Skyharbour news release dated May 16th). Skyharbour will remain the operator. The West Patterson Property is located approximately 18 km to the southwest of Alpha / Fission’s PLS claim boundary and is on strike with the W-SW to E-NE mineralized trend being delineated at the PLS uranium discovery zones. Beneath Phanerozoic cover rocks, the West Patterson property is transected by the margin of the Clearwater and Lloyd Domains. Although the significance of this contact is poorly understood it may be important given the similar tectonic/structural settings present at the nearby Cluff Lake, Shea Creek and PLS high grade uranium discoveries. The South Patterson and Draco properties are underlain by crystalline basement rocks of the Lloyd Domain which is the same geological domain hosting Alpha / Fission’s PLS uranium discovery to the north. The two properties are approximately 15 km to the south of the PLS project claim boundary and are road accessible via all-weather Highway 955 which runs north to the former Cluff Lake uranium mine. Published geological information for the Draco Property area is limited to one drill hole near the shoreline of Lloyd Lake. Airborne surveys completed in 1977 generated several EM conductors of interest and one EM conductor with moderate magnetic correlation was drill tested that year. Diamond drill hole KL-77-3 intersected 41 metres of glacial till followed by basement gneissic rocks to a terminal depth of 124 metres. Of particular note was that the basement rocks included three narrow horizons of graphitic pyritic argillite that account for the EM geophysical response. Airborne surveys and follow-up ground surveys were completed on the South Patterson Property in 1979-1980 with a follow-up diamond drill program in 1980 (four BQ holes in two areas totaling 332.7 metres). This drilling confirmed the previously identified conductor targets as graphite-rich horizons in basement lithologies with shearing and fracturing prevalent in three directions. 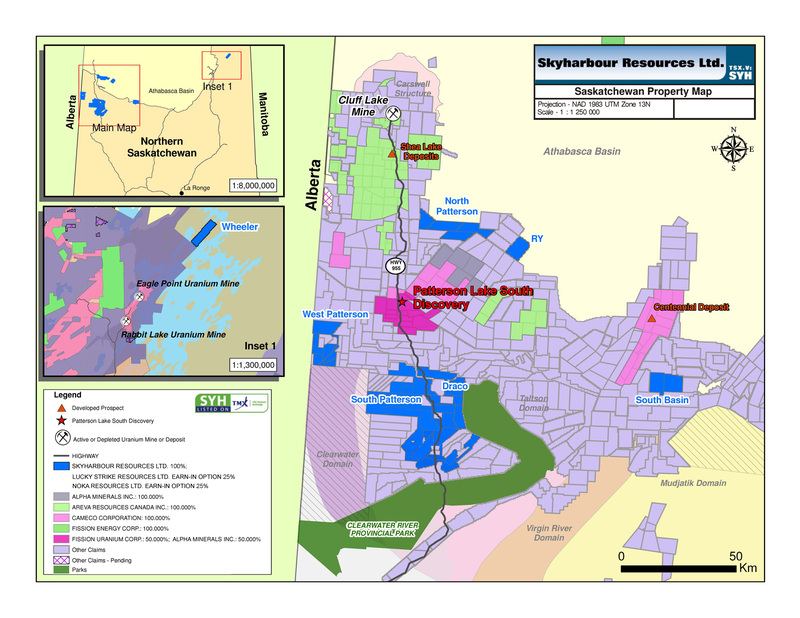 Skyharbour Resources Ltd. is a uranium exploration company with approximately 400,000 acres of prospective land between seven properties in the Athabasca Basin of northern Saskatchewan. The Company’s goal is to increase shareholder value through new discoveries and developing exploration projects in geopolitically favourable jurisdictions. The Company has 35.8 million shares outstanding.